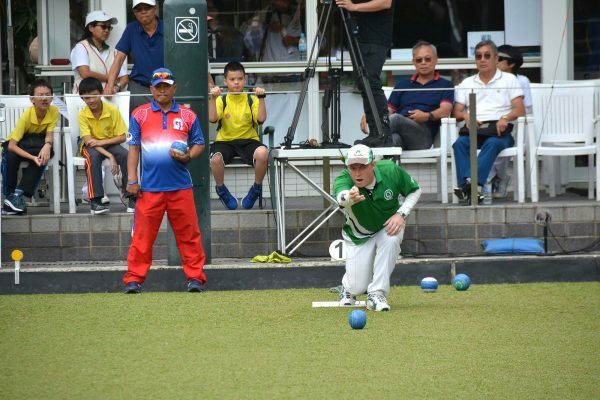 HONG KONG—After finishing second in the singles at the Hong Kong International Bowls Classic a week earlier, Irish bowler Aaron Tennant took a step further last Sunday, Nov 18, by partnering with compatriot Ian McClure to win the pairs, a title Ireland last won in 2005. The Irish Duo finished top of their group in the roundrobin stage, defeating all opponents in the process. In the semi-finals, they faced a strong New Zealand team, who knocked out the defending champions Australia in the play-off. It was a tight game and the Irish needed the tiebreaker to edge through to the final. On the other hand, 2014 champion Angelo Morales teamed up with Curte Robert Guarin to beat Malaysia and Scotland in the knock-out stage to reach the final. And what a big difference it was. The Irishmen took two in the following end. In the seventh end, Morales tried a heavy shot when his team was only one down but his shot pushed the jack to the opponent’s group of bowls. They lost five in that end and the score was tied at 8:8. In the following two ends both teams won a shot and tied the first set at 9:9. In the second set, it was the Irishmen who started strongly, opened up a lead of 5:0 after three ends. Philippines kept chasing but were 7:4 down going into the last end. Philippines held one in this end with the last bowl to play. Morales tried to push the shot bowl to further push the jack to win three. He was successful with that but the jack was not pushed far enough and he could only win two shots. McClure was delighted with the win, “The final was amazingly tough. We played the Filipino guys in the group and we just beat them narrowly. This time we are happy that we managed to crawl over the line. “This is the first time for me and my partner Aaron in this tournament. The tournament is fantastic because there are so many skillful bowlers from overseas and local. We have a wonderful time here and the title is just icing on the cake. We couldn’t speak more highly of our first experience in Hong Kong,” said McClure. 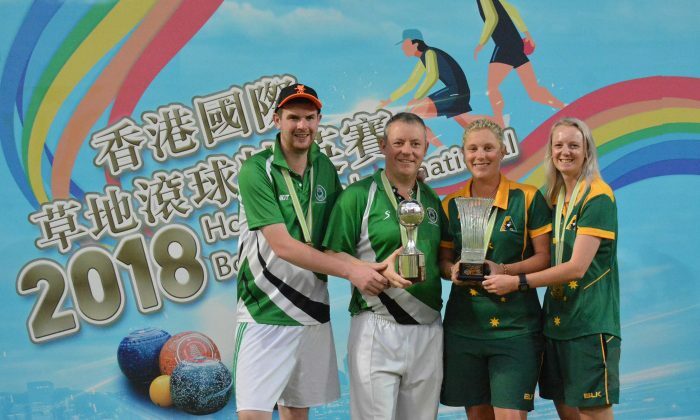 This is the fourth pairs title won by Ireland in the 33 years history of the Classic. In the women pairs, it was a game between this year’s Commonwealth Games gold medalists. Australia’s double gold medalist Natasha Scott partnered with Ellen Ryan to play against the Malaysian team of Siti Zalina Ahmad and Emma Firyana Saroji, the winning pair in this year’s Commonwealth Games, Asian Championship and SEA Games. The Malaysian women also won both the champion and runner-up of the Classic singles the week before. Both teams finished top of the table at the roundrobin stage with Australia winning all the games and Malaysia only lost once. In the final, Ryan performed very well in the first set and held shots in most of the ends, forced the Malaysian skipper to play some delicate shots to break the head. After an intense encounter, the Australian team narrowly prevailed with a scoreline of 8:7. In the second set both skippers continued to exchange shots and this time it was the Malaysian who came out on top, winning the set 9:10. The first two ends in the Tiebreaker saw the score squared at 1:1. In the last end Ryan drew three close shots, with her last bowl pushed the jack and hided it behind other bowls. Zalina’s first shot spilt the head and took out two of the bowls. Scott put her bowl at the back and forced Zalina to draw for the shot. Her last bowl was well delivered but still lost the shot by an inch. Same as last year, you may review the exciting moments of the finals on YouTube: http://www.hklba.org/live. Filipino Club will host an invitation tournament this Saturday and Sunday, Nov 24-25, from 9:00 am to 8:00 pm. Island Lawn Bowls Club will also hold the Golden Stag Cup at the Ap Lei Chau indoor greens this Saturday and Sunday, from 10:00 am to 9:00 pm. The National Singles will resume with round three this Sunday at all venues around Hong Kong.